​This workshop focuses on theoretical and practical concepts to improve our ability to communicate visually and will present emerging tools to help sort, understand and communicate our data. The objectives of the workshop are to (1) help us reconnect visual design standards with science by learning from the past and thinking about the future (first day); and (2) improve programming skills to reduce the gap between our imagination and technical limitations (second day). 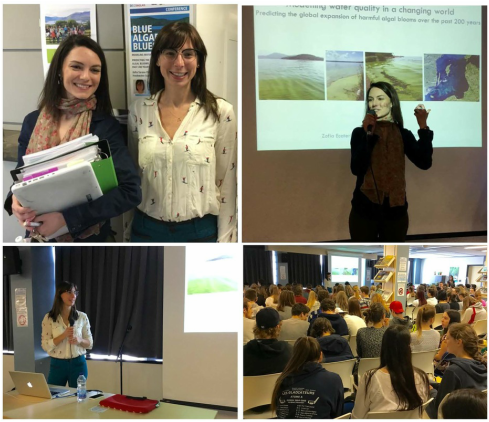 ​This was the first interdisciplinary conference between the English and Science departments of Cégep Sainte-Foy. What a great initiative! Gros merci au groupe du Cégep Sainte-Foy pour cette invitation et aux 260 étudiants qui sont venus écouter ma conférence!! A big thank you to Piero for this wonderful piece and congratulations once again for your very well-deserved Lifetime Achievement award! I am so honoured to be your colleague and feel extremely lucky to have had the opportunity to work with you! Recently, our group at the Institute collaborated on a paper on cyanobacteria and their evolution and quantitative expansion in lakes worldwide during the Anthropocene (Taranu et al. 2015). This study was co-authored by colleagues from across Canada, France, Italy, the UK, Spain and Malaysia and provides the first continental-scale synthesis of changes in cyanobacteria over the past two centuries. 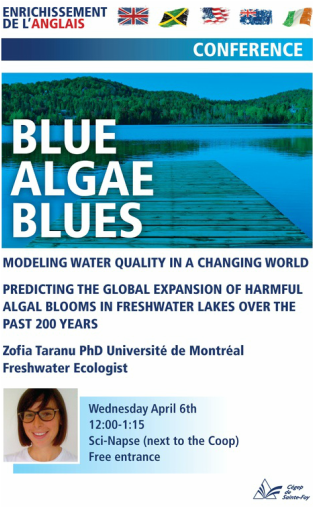 This study, conceived, coordinated and led by Zofia Taranu and Irene Gregory-Eaves from McGill University, found that not only are there now more potentially toxic algae than in the past, but their rate of increase is much greater than that of other water-borne algae. In fact, cyanobacterial populations exploded in many lakes after the advent of industrial fertilizers and rapid urban growth—a period in the late 20th century known as “The Great Acceleration”. The onset of modern agricultural practices and human-modified changes to nutrient cycles has led to a pronounced and rapid increase in nutrient loading to lakes in recent decades. Climate warming is also contributing to cyanobacteria proliferation. It was the second most important driver of cyanobacteria in our study, and in remote sites where the nutrient signal was weaker we noted changes in cyanobacterial dynamics that coincided with regional changes in temperature. Ultimately, our integrative synthesis suggests that the effects of climate warming and nutrient enrichment can interact to generate unexpected synergistic effects, thereby increasing cyanobacteria densities. I encourage young researchers to embrace new techniques and to utilize statistics and modeling approaches that will facilitate your work. Be humble enough to consider following the advice of more expert colleagues. Strive to be cooperative and inclusive towards colleagues in your work, rather than being competitive or working in small closed groups. 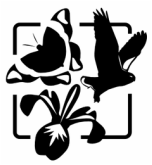 Nous avons a récemment lancé le tout premier Derby de recherche sur la biodiversité (Novembre 2015) où les étudiants ont travaillé en équipe sur un évènement intensif de deux jours pour concevoir de nouveaux projets à l'aide d’ensembles de données Open Source et de sciences participatives. Merci à vous tous d'avoir participé au Derby de recherche! C'était vraiment formidable d'entendre toutes les réflexions et collaborations qui ont eu lieu et voir les projets se développer en si peu de temps. Jean-François Lapierre and I are proud to be launching our joint initiative with LAke multi-scaled GeOSpatial & temporal database (LAGOS) to build a common database on water quality of lakes across Quebec (LAGOS-Qc). This harmonized database will compile limnological data (biological, chemical, physical) potentially available through various government programs, non-governmental and academics across Quebec. A layer of geographic data (climate, land use, lake and catchment morphometry) will be added to all limnological data. The ultimate goal is to promote collaborations between research and management at a global scale, and develop training opportunities/ partnerships among various disciplines. We recently presenting our project at l'Association des Biologistes du Québec and won the coup de coeur prize (crowd favourite)! How does increasing nutrients affect you? How does cyanobacteria bloom size change with nitrogen concentration? 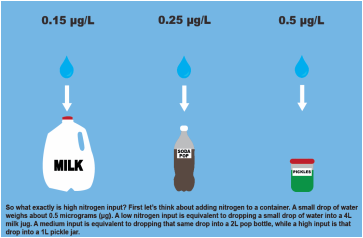 Using our interactive graphic, you can change the concentration of nitrogen in a lake. Larger circles are larger cyanobacterial blooms. What happens to bloom size as you change the nitrogen concentration? Are lakes in some areas affected more or less than others? The map is color coded for different regions of the U.S. These regions represent lakes with different water quality states, surrounding land use and nutrient levels. La prolifération de cyanobactéries, appelées algues bleu-vert, est un phénomène en pleine croissance qui menace une grande partie des lacs du monde, à toute latitude et altitude, révèle une étude internationale. New international research led from Canada suggests that blue green algal blooms are growing around the world and could threaten our health. As University of Montreal biologist Zofia Taranu tells host Steve Curwood, these poisonous bacteria are blooming more frequently in waters around the world as the world warms. It’s become an annual news story in Canada in the past few years. Every summer there are more and more reports of “blue-green” algae blooms in Canadian lakes during the past several years. A new international study is the first continental-scale historical analysis of the levels of the bacteria which can pose a threat to drinking water as certain species produce toxins which can affect the liver or nervous system. Joignez-vous à nous ! Come join us! Cette série de 8 ateliers guide les participants à travers les étapes requises afin de maîtriser le logiciel R pour une grande variété d’analyses statistiques pertinentes en recherche en biologie et en écologie. Ces ateliers en libre accès ont été créés par des membres du CSBQ à la fois pour les membres du CSBQ et pour la grande communauté d’utilisateurs de R.
This series of 8 workshops walks participants through the steps required to use R for a wide array of statistical analyses relevant to research in biology and ecology. These open-access workshops were created by members of the QCBS both for members of the QCBS and the larger community.